Last week’s tragedies are, blessedly, water under the bridge. Tierce’s limp is well-nigh gone and he seems to have forgotten all about the evils of wasps. 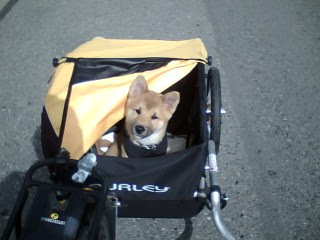 We went up to Port Alberni on the bicycle last Friday together. I have rigged up the trailer to carry him safely with the help of a VestHarness attached to a coupler that snaps on to the D-rings inside the trailer. He was a very good puppy for the trip! He did get overwhelmed by all the kids at the SCA event that we went to. My boyfriend had brought his crate and ex-pen up in the car, so he had a secure place to stay when things just got too much. I loved having Tierce at the event, but dogs require a LOT of care at SCA events (or any event that people go to in the high summer). – a cool, private place to escape to when Puppy needs to unwind. – Constant control. A dog should never be running loose at an event. Period. We had one problem with a MinPin running up to Tierce and attacking him. Not that I was worried about Tierce, but I certainly didn’t want him associating dogs running up to him with pain and aggression. People who coddle their little dogs really piss me off because then the little guys think they own the world and become hell on four legs. Luckily, the little dog was mostly kept on a lead for the rest of the event (but still managed to break free twice) and we mostly didn’t have any further problems. The Bearded Collie who also attended was a 5 year old female who had no patience with puppy antics and, although she was polite, she made it clear that she was not to be pawed about. Which is good, since Tierce needs to be taught not to be rude. Tierce passed his puppy preschool with flying colours 🙂 We’re going to enter him in the next class in September.